Data science has been gaining attention over the last few years, but as with most new trends or topics, some organisations have been slow to actually adopt and implement it. 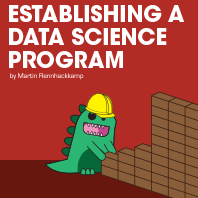 Although data science, by its nature, is quite an unstructured discipline, you may just need a more formal strategy to implement such a program in your organisation. I believe the slow uptake may be because organisations are either weary of the unknown or resistant to change. That isn’t necessarily a bad thing. However, I recently came across an interesting document on the TDWI site that at a high level covers ‘The seven steps for executing a successful data science strategy’. If your organisation is considering data science as a strategic initiative, this presentation recommends a process that is likely to be successful. I have rephrased it in terms of establishing a data science program, and not merely establishing a strategy or a capability. So, here is a review of these seven steps, elaborated with applicable commentary. Does your organisation actually need a data science strategy? Before you jump on the ‘data science bandwagon’, you first need to make the conscious decision whether data science is even necessary for your business practice. The most important aspect to consider when evaluating whether data science is for your organisation or not, is to consider the value it could potentially deliver, if implemented successfully. The best place to start therefore is by evaluating the possible business that data science can contribute to. For example, you need to ask whether data science can produce the type of insights will make the organisation stand out ahead of its competitors. Or you can investigate how data, analytics and new insights can assist to better turn newly identified customer sentiments and behaviours into revenue-generating interactions. Asking these types of questions will enable you to investigate whether ‘conventional’ BI is not perhaps already providing sufficient insights, as not all organisations will necessarily benefit from implementing data science. And, quite frankly, some organisations are just not ready for data science yet. If it proves to be viable, you can then validly present the case that you need to put a data science strategy in place in order to drive out, apply and get value from the additional insights you aim to generate. This step sounds very simple, but can be quite time consuming, and sometimes it can also turn out to be costly. It is often very difficult to find suitable staff who are not only able to perform the related tasks, but also have the necessary business insight as well as the required data science experience. Although many educational programs are now starting to produce data scientists, there are, as yet, not many of them readily available in the market – especially not with business insight and experience. Some organisations overcome this problem by appointing a team of specialists that together have the skills typically required from an experienced data scientist. This may be more costly, but the bottom line is that you have to have a resource or set of resources with the appropriate knowledge and experience. This is vital to get value from implementing a data science program. Data science can only be successful if the whole team communicates with one another, and with the business. Data science is by its nature a very collaborative initiative, so it follows naturally that communication is essential. This step may seem easy, but as always when people are so busy with their daily activities, they sometimes forget to stop and talk to one another. The data scientists have to be encouraged to share the approach and outcomes of their analyses with the business team. They need to take the time to find out what it means for the organisation – especially if the analysis will have a strategic business impact. Business knowledge, business impact, business value and in-depth communication about these are all equally as important as statistics, data manipulation, business intelligence and the various types of analytical models. In the previous point we highlighted how important communication is. The typical outcomes that data science produces is analytical indicators, such as probabilities, and other statistical measures. However, many key decision-makers may not understand these outcomes and are therefore not likely to be interested in the outcomes, never mind drive for improved business outcomes using these deliverables. However, when you “grow” and implement an analytical culture into the organisation, visualisation and storytelling become very useful approaches for the data science team to present such figures and outcomes in a user-friendly way. In fact, I have previously advocated that data scientists should always remember to use visualisation and storytelling when communicating data science insights with the business. Data is key – it is called “data” science, after all. The team needs to work very closely with the data at a very detailed level, and they often require access to a very recent and wide data set so that they can be sure not to miss any ‘fresh’ or new insights, which could have the potential to deliver great business value. As a consequence, the data science team often requires access to everything available in the BI ecosystem, and then some. The latter can refer to data not yet available in the data warehouse, more detailed data, or data only available from external data sources, which may or may not include volumes of fast arriving complex unstructured data. In most organisations I have consulted to, this is technically enabled by implementing an analytics sandbox environment for the data science team. This area is where the wider and deeper dataset is processed, prepared, investigated and analysed in ways that cannot be done within the more rigorous confines of the BI ecosystem. We typically also implement a few governing principles around the sandbox environment to protect that un-validated insights do not find their way into productionised reports or other application or decision-making areas. Businesses can execute on data science outcomes at a better level if they strengthen the connection or link between analytical outcomes and business processes. This also means moving beyond “descriptive” analytics – which only answers simple questions about trends and events – to predictive analytics, which can help determine what is likely to happen next. By streamlining how an organisation develops and positions predictive models, they can expand their use of data and new insights into more operational processes. For example, it is very useful to know the probability that a customer is likely to churn, leave, default a payment or even adopt a new service (which are all indicators derived by applying advanced analytics) when a customer-facing agent is interacting with the client. But this implies that those insights have to find their way from the data science team and their environment all the way into the operational systems. The best way to implement this is to create a migration route, whereby analytical models and their results can be migrated from the sandbox environment through to interface into the productionsed application systems. So whereas we may deduce the new insights in a relatively unstructured environment through oftentimes quite creative processes, once those insights are being used in day to day business processes, they need to be tested and productionised through the same well-controlled processes as other business data and applications. Because of all the information that organisations can obtain about customers, you find that some people find this intrusive. In fact, in the retail environment consumers are often really taken aback by the amount of knowledge a retail chain or store has on them. In fact, we have all heard the war stories where some retail stores have faced legal cases, as consumers feel that their privacy has been breached. So, when examining a data science strategy firstly your data science team, and secondly your compliance officer or your executives have to establish the right balance between what they can achieve through analytics and what is ethical. Some countries and some industries have consumer protection acts or privacy laws that have to be adhered to. You need to be sure that in the quest of analytical supremacy your data science initiatives don’t violate these acts, laws or even just plain common sense of what is ethical. So while I believe that in some organisations and in some industries data science can play an invaluable role in creating or even changing an organisation’s business strategy, I do still think it’s important for the decision-makers to be mindful that they need to devise and implement data science according to a well thought out strategy. It may be as simple as the seven steps discussed above, but following such an approach can ensure that data science makes a positive impact on your organisation’s overall business practice.